Steve Giglio’s executive communication development programs achieve immediate and long-lasting results. He tailors each program to meet the needs of the company and the skill set of the individual. These programs generate an immediate shift, creating real opportunities for improved leadership and productivity. When you have confident leadership, you have the confidence to let them lead. 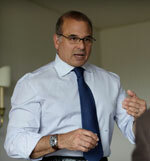 Steve Giglio’s executive development programs, tailored to the needs of each individual, provide your executives with new tools and techniques essential for effective leadership and management. Once the program is completed, your team will have a blueprint from which to work, infusing their own style while ensuring the company’s culture remains intact. The person who said “change doesn’t happen overnight” had not met Steve Giglio. Steve accelerates the change you want by quickly influencing the behaviors of your executives. Then he anchors the longevity of that change by remaining engaged with the executive, tracking progress and providing direct counseling during challenges. Steve Giglio knows that you don’t have six months to determine if his leadership development programs deliver results. His programs are designed to have an immediate effect. Your executives will leave their first development session with new management skills and tools that they can use at once. Through research, peer interviews, extensive sessions with the individual and his unique insight, Steve quickly pinpoints areas of developmental need and tailors a program to address them. Executives are able to implement the strategies developed and their teams take notice. Your teams must know your customers to be successful. You must know your teams. Steve Giglio will help define the strength of each team member so you can put them in a position to thrive. He will find areas needing attention so you can proactively address them head on. And he will do it quickly. Using his keen insight and intuition in concert with his finely honed business acumen, Steve will assess your team and create a plan for managing their unique personalities effectively. Click here to view case studies of the real results Steve Giglio achieves.